Why eat inside when you can enjoy the cool crisp air. Front of Home, very cute and well-groomed. Fully stocked Kitchen with all pots, pans, & utensils. 4 person dinning table; great for an intimate dinner. 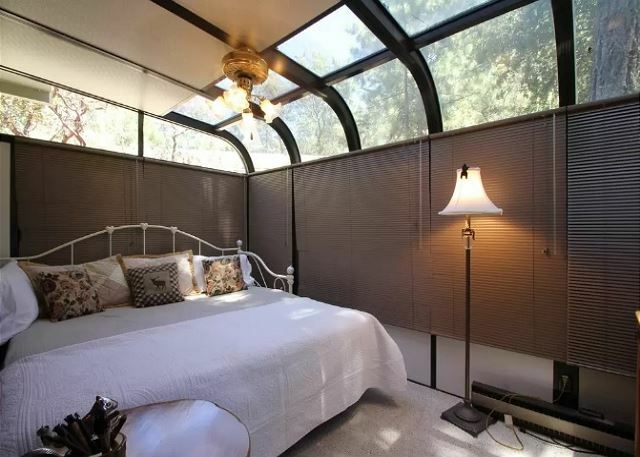 2nd Bedroom with trundle bed that is king sized and skylights. Futon can be used as additional sleeping arrangements. Spacious backyard, your dog will love it! 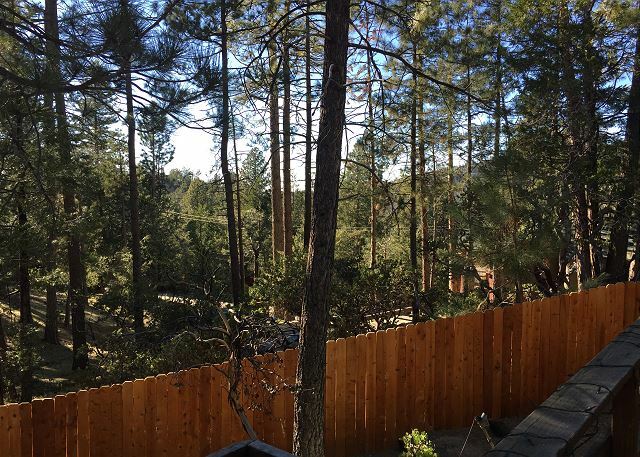 Views of the tall pines from the back deck. Bird feeder in the back yard. Backyard is fully enclosed, so you can let your dog run around like he would at home. Welcome to Manzanita Retreat! You can’t help but fall in love with it’s charm , this home is where your heart will be. 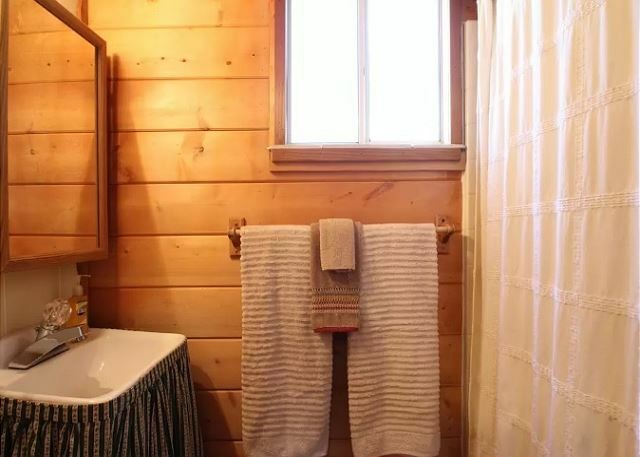 This home is perfect for a couple or a small group or friends who enjoy the novelty of a classic cabin in the woods but also enjoy the convenience of modern technology. When you walk into the home, you are welcomed into the common area. The décor is meticulously placed and gives the room warm, welcoming ambiance. 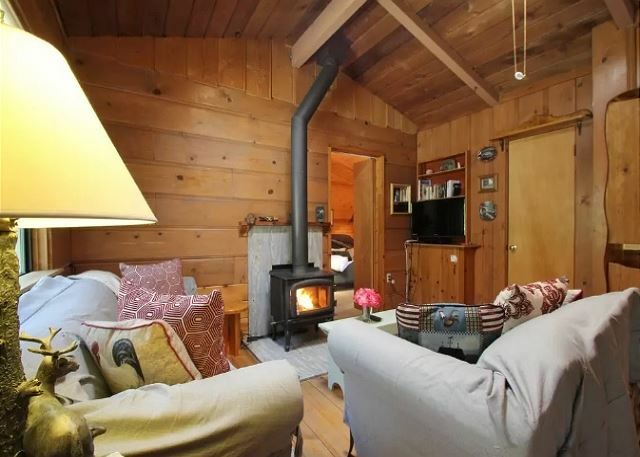 The living area’s stove place fireplace is the perfect place to snuggle near while having a movie night or reading a good book while drinking your morning coffee. 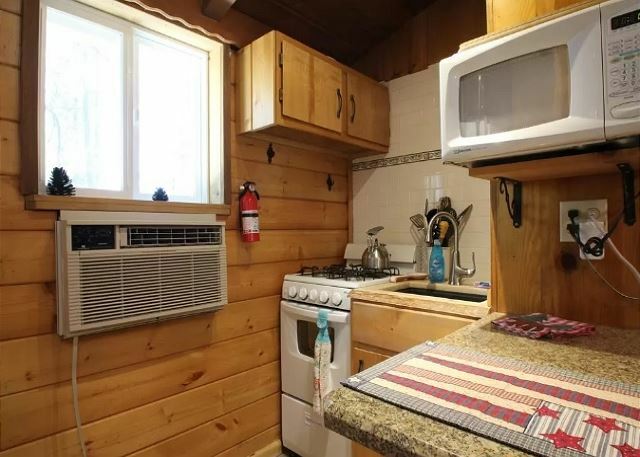 The cabin’s cute kitchen and has a very European feel and is fully stocked with all the essentials so one can easily whip up a delicious meal. The dining table seats 4 and there is also the option of dining outside on the deck. The yard is fenced in, meaning your canine companion can have fun running around like he would at home. 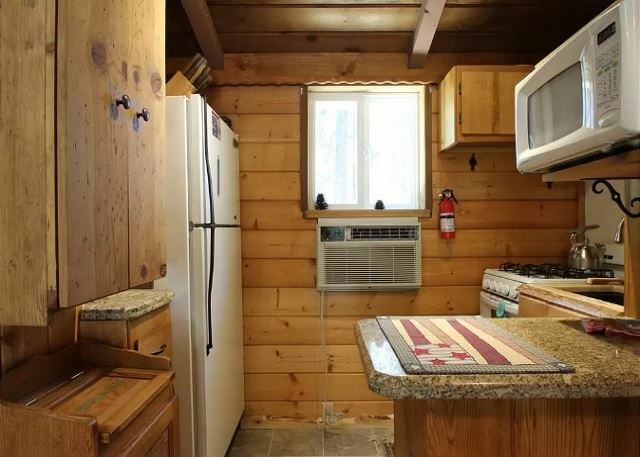 The cabin has two bedrooms. The first bedroom has a queen sized bed and the 2nd has a trundle bed that is made to be a king sized bed. 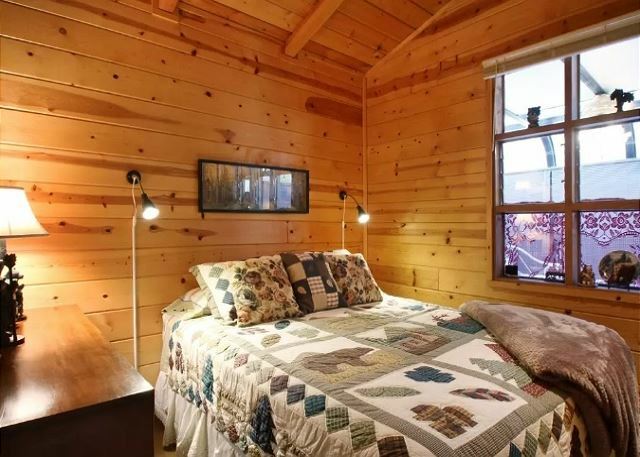 The skylights in the 2nd bedroom makes mornings feel enchanted, waking up to the clear mountain morning sky, watching the blue jay’s singing their morning song in the tall pines. There is also a futon available as an additional bed, making the home capable of having 6 guests able to sleep comfortably and in private. 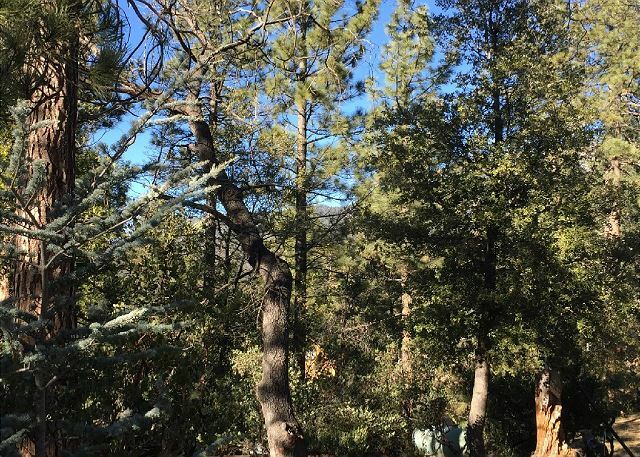 Manzanita Retreat is perfect for a romantic couple’s getaway for those who want a break from city life and enjoy the peace and beauty of the mountains. It is also perfect for a small family who want to bring up their kids and the dog up to the mountains for a fun-filled relaxing weekend. 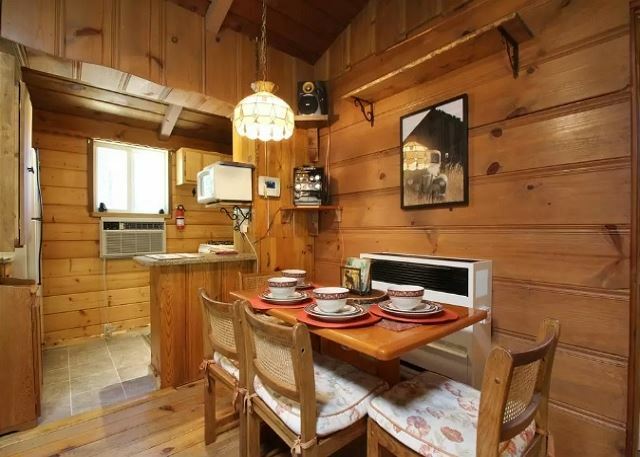 It can even be perfect for a group of close friends who want to spend some R&R together. 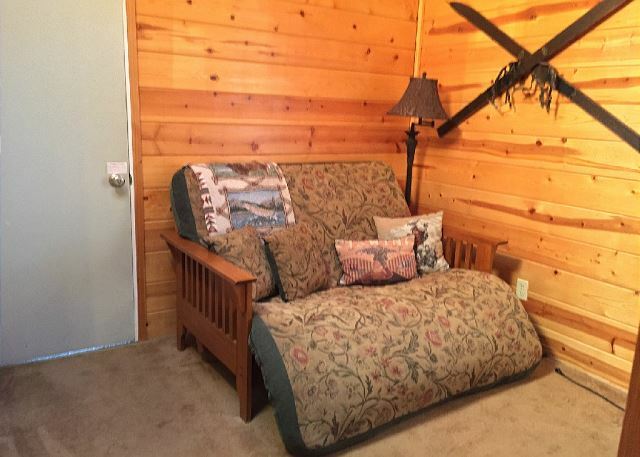 Weekend rate Friday/Saturday is $200.00 p/night. Weekday rate Sunday thru Thursday is $175.00 p/night. Winter Holiday rate $250.00 p/night (Thanksgiving, Christmas, New Year's Eve), with a 4 night minimum. 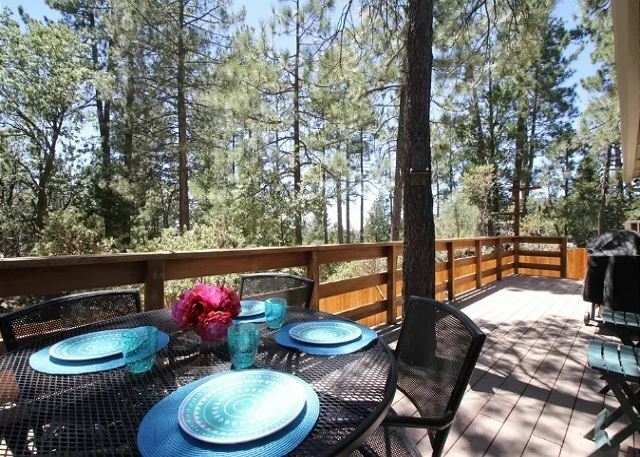 Holiday rate $225.00 p/night, a 3 day minimum may be required. Call us for our weekly/monthly specials. Pets are welcome. Pet fee of $25-35 per pet/per day will apply. Linen/Prep fee $95.00. &ad a womdrrfu time despite the rain. The fenced backyard was 100% secure for our dog, who loved being able to get outside off-leash. Walk to town and trailheads were a manageable walk. 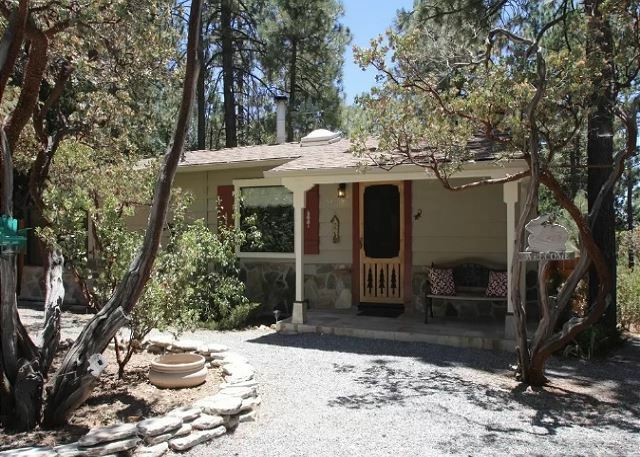 Idyllwild is a cute, dog-friendly town. We'll be back!